Can Ams, Trans Ams, Le Mans, Indy cars, F-1 and NASCAR; you would have thought by now, that Roger Penske had done it all. Well- he had almost done it all. Were you as surprised as I was to learn that the man who has employed the likes of Rusty Wallace, Kurt Busch and Mark Donahue had just won his first NASCAR Sprint Cup race Sunday at Watkins Glen with…..Joey Logano? Donahue was the one of the original “road course ringers,” Busch a former champion and all around solid driver, and Wallace, besides being one of the all-time greats was a road course beast, recording six victories on tracks of right and left turns. The team who has done everything from win the Indianapolis 500 to the Daytona 500 has never been a Cup winner at Watkins Glen before. Even more impressive is pulling it off with a driver reeling off his first ever weekend sweep in NASCAR- his first road course victories. 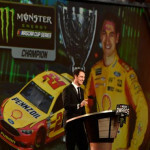 A lot of the recent talk has centered on the performance of Joe Gibbs Racing, while Kyle Busch has been tearing it up in his rally to the Chase. Lost in much of that talk has been some fine racing by Roger Penske’s dynamic duo of Brad Keselowski and Logano. Write this pair off at your own peril. 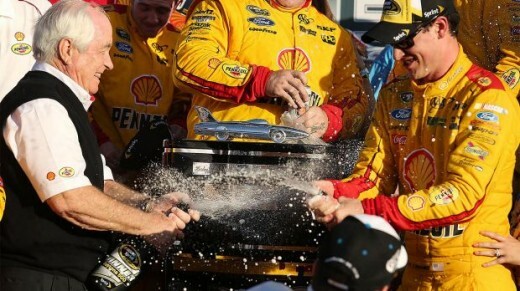 Not many are saying it, but the win has to be especially sweet for Logano, after all the abuse he’s taken at the hands of Kevin Harvick. The defending Sprint Cup champion ran out of gas on the last lap, and I’ll be doggoned if it didn’t look like he didn’t try to deny Joey one more time with a heavy touch of the number four’s nose at the end. The bottom rail was on top on this day. Among owners, Roger Penske has been one of motorsports’ true renaissance men, capturing trophies in just about any kind of racing imaginable. “The Captain” has run a tight ship, and he’s proven himself a wise one at that. 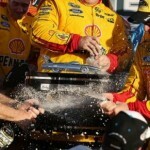 Are more achievements headed Team Penske’s way? You bet. This man’s a winner- one of the most respected figures in the sport.